Mahir Muhovic is an ambitious young man who knows what he wants out of life. He has set clear goals and he is taking the necessary steps to achieve them. The YES Center of SOS Children’s Villages has helped him increase his chances of starting a career. Mahir, 23, lives in Sarajevo, the capital of Bosnia and Herzegovina, a country where young people struggle to find employment. In 2017, the youth unemployment rate was over 43% according to the World Bank. But Mahir is confident that he will find work. He is currently in the last year of his studies at the University of Sarajevo and will graduate with a Bachelor of Science in mechanical engineering. But Mahir is taking additional steps to increase his chances of starting a successful career. 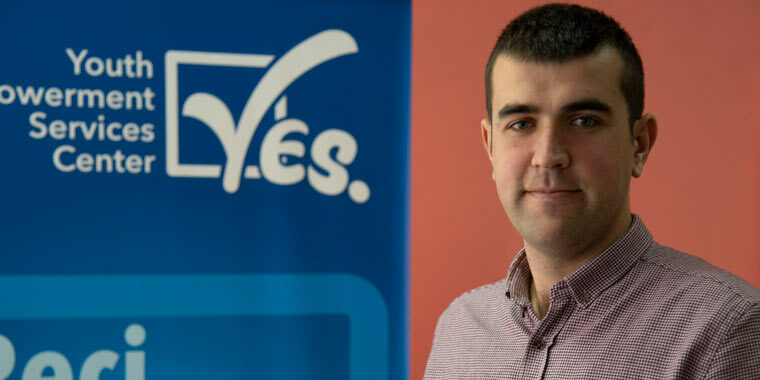 Since the beginning of 2018, he is participating in employability training at the YES Center (Youth Empowerment Services Center) of SOS Children’s Villages where young people get support to prepare for the labor market. Mahir has taken a variety of courses through the YES Center that covered topics such as time management, communication, presentation skills and CV writing. Additionally, he has taken English and German classes to improve his language skills. Mahir learned early on how decisive it is to have a steady income in life. His parents divorced when he was 13 years old and his mother was unemployed. As his family was going through a difficult time, they received support from the SOS family strengthening team for two years. “When my mother’s employment situation improved, the entire family’s situation got better,” says Mahir. A more stable family income allowed Mahir to finish the fourth year of high school, a prerequisite for entering university. Mahir has stayed in touch with SOS Children’s Villages ever since. He even started to volunteer at the Resource Centre of SOS Children’s Villages where children and families from disadvantaged backgrounds can find help. At the YES Center, young people like Mahir can get support and training to define their career goals. When he heard that the YES Center was opening its doors as part of the Resource Centre in 2017, he immediately knew that it was a unique opportunity for him to gain additional knowledge and skills to become more competitive for the labor market. Last summer, the team at the YES Center helped Mahir to get practical work experience through a five-week internship at the mechanical engineering department in a production company in Germany. But Mahir’s zeal to gain experience does not stop there. He is considering enrolling in vocational training to earn a diploma to qualify him as a metal production operator. In information sessions with human resource managers from different companies in Bosnia and Herzegovina, he has learned about which skills employers are looking for, and he knows that this vocational specialization is in high demand in his country. The YES Center offers a variety of courses, including IT skills training. Mahir’s long-term goal is to have his own production company and become a supplier for the automobile industry. He plans to participate in the business plan development training at the YES Center in the future. But he first wants to gain work experience and then pursue his dream of owning his own business. Mahir’s recommendation for other young people in Bosnia is to not be passive when it comes to building their own futures. “No one will come and pull you by the hand if you don’t move yourself in a direction,” he says. He has learned through his own experience that perseverance and dedication pay off.